We have all been given an extraordinary gift, and this gift that is precious and wonderful beyond understanding and measure is life. as we travel on our paths. Life: the joys and heartaches, the laughter and tears, the expected and unknown, the blessings and the curses are mingled together to mold and shape us as our years grown in number. Life is the most sacred and incredible gift that we will ever be given, and we must do everything in our power to honor and cherish this incredible blessing. Living an embraced life is just one example of how we can make the most of the precious gift that has been bestowed upon us. and how to we live in such a way? One definition of embrace is to hold tightly and lovingly, which is something that we should definitely practice in our lives. Another definition of embrace is to enthusiastically accept or support something. An embraced life is engaging in both of these practices: to hold on tightly and lovingly, and to enthusiastically accept and support things that come our way. The “embraced life” is one in which you practice love, kindness, acceptance and support during whatever trials or triumphs are placed in your path of life. The embraced life embraces all things: the good, the bad, and the in between. The only thing certain about the precious gift of life is that it is not certain. No matter your age, health, or status there are no guarantees in life. Your time on this Earth, the precious gift of your life, can expire at any moment. There are no guarantees. Your plans may fall exactly into place, or your plans may go totally awry. You may travel smoothly along your path, or you may travel a path that is full of mountains and curves and bumps. The one certain thing about life is that you can never be certain of what lies ahead. When you live an embraced life, you cherish and live life to the fullest embracing whatever comes into your path. This helps the uncertain, the unexpected, to become more tolerable and manageable. We are human, and we are not created or born to be perfect. We may strive for perfection, but we are not divine, and therefore are imperfect. We are imperfect, flawed, chaotic, beautiful disasters of creation entrusted with life as a precious gift. The embraced life allows us to embrace ourselves as imperfect, as continual works of progress along our paths. Our stories have yet to be written. We were not finished yesterday, and we are not finished today, and our story will still remain unfinished for an undetermined amount of tomorrows until we take our last breath. Only then will our story be realized in its entirety. When we lead an embraced life, it adds flavor, strength, and character to our story. It is easy to embrace the good things, the joys, the blessings, and the triumphs in our life. 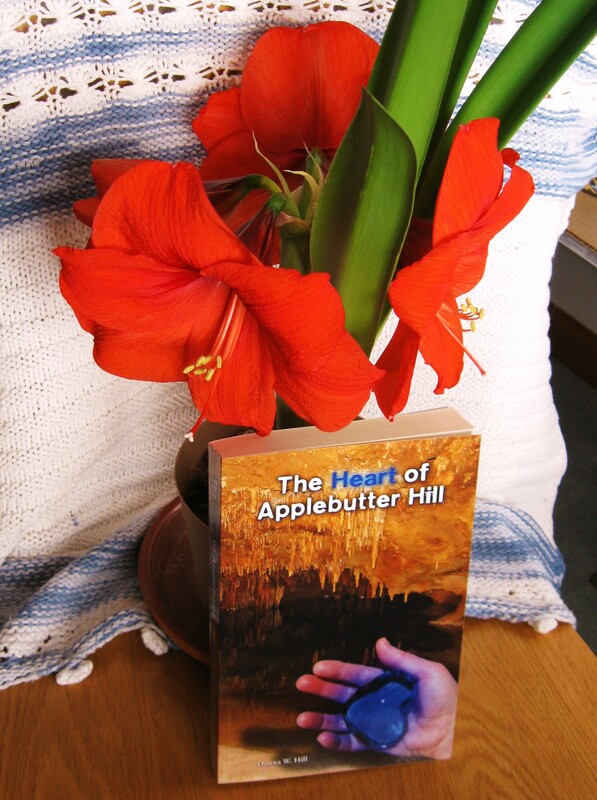 We encounter those things to give us a taste of sweetness, and fulfillment, and satisfaction. These happy moments bring us peace and light in the dark, scary, and difficult moments in our lives. The embraced life recognizes that the blessings always outweigh the burdens. Repeat this: the blessings always outweigh the burdens. Always. Even when it seems that there is no light, no peace, no joy to be found, it is during those times that we cling to, and draw from, the happiness, joy and blessings that we have been given in our lives. As we cling to the good, the light and the peaceful blessings, it enables us to travel the rough patches with grace and strength. When we are experiencing the dark, overgrown, troubling parts of our path in life, it is easy to wish things were different, to wish for better days, to wish for greener grass and a smoother road to travel on. It is our nature to wish for those things during hard times. We are not perfect. We are not built to handle everything perfectly and with grace all of the time. When you live an embraced life, you embrace the dark, rough, and troublesome times. You embrace these times with as much support, acceptance, and love as you embrace the happy times of light and peace. Wishing for better days, better times, and better things is futile. When you embrace the bad, as well as the good, it will bring you abundance beyond your wildest imagination. The concept of living an embraced life is something that I have witnessed in action, an ideal brought to fruition, as I have watched my parents, grandparents, aunts and uncles growing up. I have witnessed by many excellent living examples what it means to live an embraced life. On my own path, I have done my best to lead by the example that I have been given by my family, to lead an embraced life. The practice of living an embraced life has been particularly beneficial to me in the past few years as my husband and I have experienced several ups and downs in our family, especially with our medically complex, special needs daughter Elizabeth. We have had to learn to embrace the good with the bad, the trials and the triumphs, and the blessings and the burdens along our path together. I can say for certainty that we did not plan for, expect, or anticipate any of the challenges we have faced, especially with our daughter, but by leading an embraced life to the best of our abilities, we have definitely witnessed miracles. Above all, through all of the uncertainty, we are certain that the blessings outweigh the burdens. I challenge you to live an embraced life. Live the life you’ve always dreamed of and always imagined. Live life to the fullest. Create something every day. In each day, embrace the triumphs and trials, the blessings and curses, the beautiful and the ugly moments. Embrace it all. Embrace the life you’ve been given, the path that you travel, the blessings and the precious gift of life. It is yours to live. It is yours to embrace. It is your gift. Cherish it, live an embraced life and remember that the blessings outweigh the burdens. Always. Tara Bly Hackwelder is a stay-at-home mom for her two children Celtan (age 5) and Elizabeth (Age 2). She recently left her teaching career behind to become a full time caregiver for Elizabeth, who has many rare and complicated medical and special needs. Tara and her family live in Butler, PA, and she is a native of Chicora, PA.
B.A. in Psychology from The Pennsylvania State University with minors in history and journalism. M.Ed. from Slippery Rock University of Pennsylvania. Tara has worked as an adjunct professor teaching social science courses, as a social worker, teacher, and in many other capacities as an advocate for special needs and minority populations. Tara’s interests include writing, as she currently writes a blog about her daughter’s journey, at www.teamelizabethjeanne.blogspot.com. She also writes a blog about love, life, housewife/ stay at home mom tips, recipes, and crafting at www.alovespicedlife.com. She enjoys crocheting, fashion, advocacy, baking, reading, history, philosophy, teaching, volunteer and humanitarian efforts, traveling, and spending time with her family and dog. You can follow Tara on Twitter and Instagram @alovespicedlife. In my previous article, Little Steps #2, I spoke of my personal challenge to STOP speaking words of criticism, complaint, and gossip. It is an ongoing challenge – much more difficult to do this than I could have imagined. In today’s article, I introduce you to Little Steps #3 when I move on to discuss HOW we can develop our words more carefully and change them from negative or weak words, into powerful, life altering words. If you are a writer this Little Step might be what you need to think about in developing your work. This Little Step is a good one for anyone, in any profession. I created 2 lists and tacked them on the wall beside my computer. I need to look at these 2 lists often to remind myself to use more powerful and direct words. I use my 2 lists to edit my writing. Create your own lists and check them often until you get in the habit of looking for the words that are weak and feeble in your writing. List #1: Passive Words – they give a feeling of uncertainty to your writing. You want to be direct and certain, not wishy-washy. Go through your writing draft and change the passive voice into strong active voice. Review your writing, then get out your blue pencil or hit the delete button on every word from this list. Replace those “busy work” and “filler” words with powerful clear words that make your piece strong. When you CHANGE YOUR VOCABULARY, a better choice of words enables you to speak and write better. You will feel like a WINNER! When you say “I can’t” you’re telling yourself, or others, “I won’t.” In Little Step #2, we decided “NO MORE EXCUSES for YOU – Change your words – change your mind. Recognize feeble words and self-defeating excuses. Just don’t say those words anymore! You can do it. 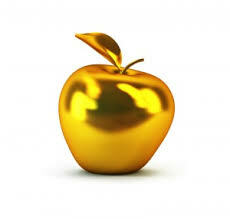 Be a GOLDEN APPLE in a SETTING of SILVER. Written and published by Lynda McKinney Lambert. Copyright, 2015. Al Rights Reserved. Little Step #2 – No More Excuses for YOU! Little Step # 2 – No More Excuses! OK, so you have been making a ton of excuses about why your life is not what you want it to be! Yes, I can just hear you now – complaining about all the things you don’t like, even the weather! And, along with that, we get caught up in passing along a tidbit of gossip, and we criticize others as well as our self. Isn’t it time to take control of all this, turn it around, and make the CHANGE in our life that will be meaningful not only to ourselves, our families, and the world we live in? Are you ready to stop the complaining? Gossiping? Criticizing? Ready to begin taking the next step in the direction to change all that? 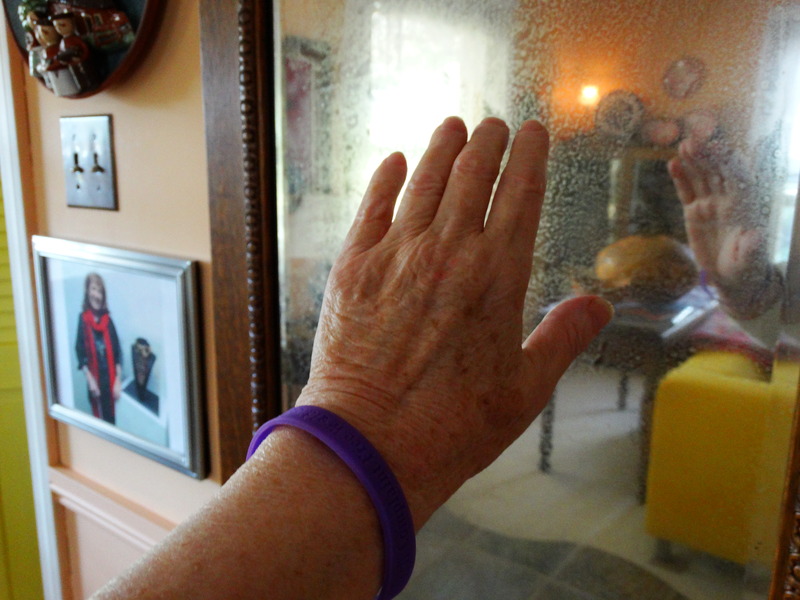 I joined the challenge – and I am wearing the PURPLE BRACELET every day. Every time I find myself uttering words that are complaints, gossip or criticism, I have to move the bracelet to the other arm. The goal is to have 21 complaint free days in a row – the bracelet must stay in place on one arm for 21 days! That is the number of days it takes to begin a new habit. I will tell you the average person takes 4 to 8 months to achieve this goal. After a month, I have had only TWO complaint free days in a row. But I am determined to live a complaint free life and I will keep on going with this challenge no matter how long it takes. I purchased 10 of the bracelets because I knew it would take me quite awhile to change my speech patterns! You will be surprised at how many times you utter words or comments that are not complimentary, critical, or even gossip once you begin this challenge for chang. It’s a kind of unease, deep down inside of you. You will feel some disappointments in yourself and even a longing for change. You begin to realize it’s in your hands to make this change. Only you can learn to get your tongue under control. June is the perfect month to consider the elimination of your excuses – Ask yourself, What has kept me from experiencing a satisfying life. Let’s make June as a time of NEW BEGINNINGS! Think about what you personally CAN do and take action. Write DOWN what you WILL do. Put little reminders all around your house – write your INTENTIONS on sticky notes, and put them where you will see them all the time. Keep them in the forefront of your mind. If you are visually impaired, as I am, a reminder like my purple bracelet keeps me on target. I reach over and touch it, move it around, and remember my goal to stay positive today. Learning to keep silent is difficult. Learning to use wisdom and grace instead of quickly stating your own opinion on a matter is something we all can learn to do. But we have to stay focused on our intention to be complaint free all the time. Ask yourself what you WILL do, and then listen for the response. Learn to be quiet and listen to your spirit. Don’t worry; it won’t be something beyond your capabilities! The CHANGES you MAKE will be little steps that come when you learn to remain quiet and have a sense of waiting on God for your leading throughout each day. See where YOUR LITTLE STEPS take you. and YOUR personal talents and passions in life. You may like to read: A Complaint Free World by Will Bowen. This challenge is an eye-opener when you actually begin to make the changes. – well, lets just say, it is quite revealing. Will you join ME in making life changes in your world? If you do, let me know how it’s going for you. We can keep each other encouraged as we CHANGE our WORLD. No More Excuses for Us ! It is because the words we speak are creative – the words create our future and the conditions of our present. We become what we say and we receive what we created by our speech. Guard your mouth because it is a matter of living an abundant life or a life of constant drama, struggles, and disappointments. For me, the purple bracelet challenge is a little step in the BEST direction for my life. How about you?